“We want to be seen and treated as equals” – Woman who participated in the workshop. Before the interactive urban planning workshop began, children tinkered with the thousands of small objects we had placed on the tables. Watching their children play put the Latino participants at ease. It was a great start to the high-energy workshop. We (Gerardo and James) were able to conduct two participatory workshops that were well received and attended by Spanish-speaking, low-income, marginal populations, many of whom were unauthorized immigrants. We conducted one in Springfield, Oregon and the other in Eugene Oregon. Ninety Latino participants, whose voices are usually left out of the planning process, came to share their visions for their communities. Between 15 and 20 other participants – teachers and principles at the elementary schools where the workshops took place, city staff, leaders from the University of Oregon’s Sustainable Cities Initiative and staff members of the Sightline Institute (who will develop regional indicators based on the findings from the workshops) – came too. The workshops were organized by Professor Gerardo Sandoval, of the Planning, Public Policy and Management Department at the University of Oregon as part of a HUD Sustainable Communities Grant to engage marginalized Latinos in Eugene/Springfield Oregon on urban planning issues. James Rojas, founder of Place It, came from Los Angeles to offer his extraordinary collaborative planning method. We intentionally invited children to participate in the workshop for the following reasons: to allow parents to spend time with their children, to give children a voice in the city planning process, so they could learn how community engagement can be fun, and to ease the seriousness of the planning process. The community meeting was like a family gathering with much activity. The first workshop asked a very broad question: How would you create your ideal community? The second workshop asked them to identify a specific problem in their neighborhood and to design a solution to that problem. The elementary school cafeterias were transformed into an urban planning studio where participants sat along side their children at tables as part of the workshop set up. We put thousands of small objects that they would use to recreate their ideal communities in twenty minutes. They were given no constraints. We assured them that there were no right or wrong answers. We gave pictures, no maps and no discussion time! After a quick introduction to the process the children got up from their seats and gathered around the big tables to look for materials. Their parents, who initially seem a bit reluctant to engage in a childhood activity, followed the children. Once the adults started to see, touch, and explore the materials in front of them, they dove in. They began choosing pieces that they liked – that would help them convey their ideas. They gathered up pieces and placed them on their colored construction paper in front of them. Their hands began to move furiously as their designs and ideas became more developed and elaborate. Many participants got up to find additional materials. For the next ten minutes the participants were in a meditative state of thinking about how they would improve their communities. 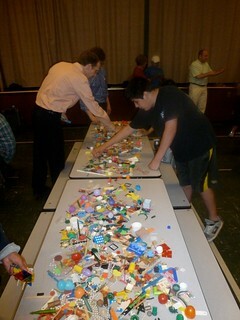 The flurry of activity slowed down after participants were satisfied with their models. They began to talk and look around at the others’ dioramas. They pulled out their cell phones to take pictures of their beautiful models. One participant explains her model to James Rojas. In a little less than twenty minutes we sensed the group was finished constructing. James told every one, “stop building!” The real fun – the informative part of the exercise when everyone would present their ideas to the group in one minute – was about to begin. We asked the presenters to state their names and where they were from before their one-minute ideal community presentations. We started with a table of toddlers to see their models and hear their ideas. Dozens of ideas emerged. Participants illustrated their memories, places, struggles, ideas, concerns, and their suggestions to improve life for their families and communities. People focused on three issues. Many people stated that they wanted to feel more secure. This had to do with feeling a sense of belonging in the community. This makes sense, as many were unauthorized immigrants. Even though Eugene and Springfield have some of the best public spaces in the country, the participants of these workshops were still longing for active use of public spaces. This probably relates to issues of them avoiding public spaces because of their unauthorized status. Their unease with being a part of the greater community really came through in these workshops. For example, instead of asking for social services or planning services or saying that their housing or transportation could be improved, they spoke about wanting a better sense of belonging and the ability to enjoy public spaces. This is fascinating because we would have never thought about these issues if we kept the process top-down with only a pre-determined set of options as potential concerns. In addition, we provided food at the workshop. Unauthorized communities live in the shadows, away from the watchful eyes of city planners and public authorities. Many don’t trust the city officials, academics, or community development people who would like to understand the key issues immigrants are facing. Even though authority figures might be well-intentioned and eager to help improve life for these low income marginalized populations, issues of mistrust and fear at placing these communities at higher risk get in the way. In a situation like this, it is critical to start by learning how to reach out to one of the most marginalized and vulnerable populations and understanding their visions for creating their ideal city. Outreaching to these populations is extremely difficult. In smaller cities and in rural communities in new destination states, Latino unauthorized immigrants stand out. The racialized and politicized immigration debate in the U.S. makes for a toxic environment. In order to get people to participate, we used an outreach strategy based on networks. We first identified where Latinos were participating and we went to them to engage them in safe and comfortable ways. We partnered with community-based organizations (Huerto de la Familia and Pilas) that had already developed a sense of trust in the community and they helped us conduct the outreach. Everyone participated in designing his or her ideal community, regardless of age. Everyone felt comfortable and had fun. We did not use power points, maps, or any of the typical abstract planning tools. Their feedback was genuine and deep. Finally, it created a strong sense of community because people shared their ideas with each other rather than a city official or professional designer. The participants spoke with conviction, enthusiasm, and concern for themselves, family, friends, and community. They were animated and used their hands as they lead us through their models. All of the participants surprised themselves and inspired each other with their ideas. Post by Gerardo Sandoval and James Rojas. The unity among the people in these workshops is tremendous. It helps them to be more innovative.